After Kickstarter failed to get off the ground in 2014. Big Ben (that's the video game publisher and not the grand London timepiece) has announced its intention to publish a remake of Outcast—and it's being developed by Appeal, the studio behind the original. The remake will be released "at the start of 2017 under the name Outcast - Second Contact", with a remastered soundtrack and voice acting, and with new character models, animation and environments. Oh, and we might have to hold a memorial service for the original's striking voxel-based 3D art assets, as they're being swapped for the more widely used polygons. NeoGAF dug up the press release and a German announcement video, although you can watch it with subtitles. It doesn't show any screenshots or footage of the remake, but it does shed a bit more light on the team's plans. We can expect images of Second Contact soon, the first trailer a bit later after that, and if the remake does well, there may even be a sequel. Of course, there already was an Outcast reboot in the works a few years ago, but the Kickstarter failed to reach its funding goal. 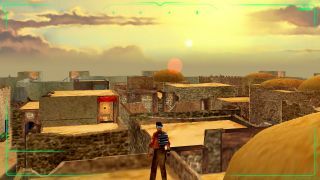 Back in December 2014, a slightly jazzed-up version of the original game appeared on digital stores, that had been reworked to perform and look better on modern PCs.